This elegant and sparkly foil tassel garland will make a great decoration effect for your event, celebration, Christmas, New Year's Day. Hang like a bunting, use as a backdrop for a dessert table or photo-booth, as a streamer or pompom attached to giant balloon! We are the only manufacturer to make foil tassel in flame-retardant quality. Each Fringe measures about 30cm long and 12 tassels are supplied to make garland from 1,50 Metre to 2,50 Metre. 2,50m of white thread are supplied with this tassel garland. You can easilly combine colours as we propose over 9 combinations unicolored, bicolored and multicolored. Perfect to hang from the wall, branches of Christmas Tree. 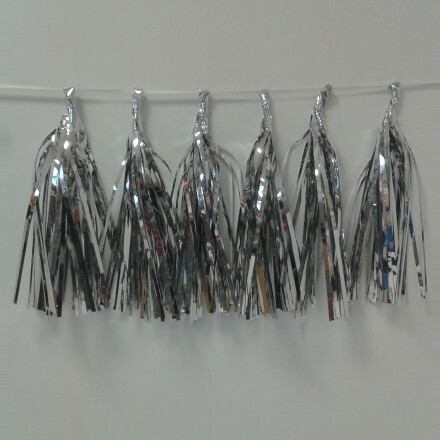 Flame-Resistant foil tassel garland 12 silver pompoms. you can make a garland from 1,50m until 2,50m. 2,50m of white thread are supplied. Pompom length is about 30cm (12 Inch). 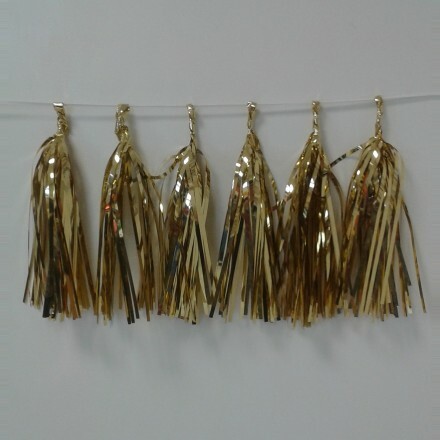 Flame-Resistant foil tassel garland 12 gold pompoms, you can make a garland from 1,50m to 2,50m. We supply a white thread of 2,50m. Fringe length is about 30cm (12 Inch). 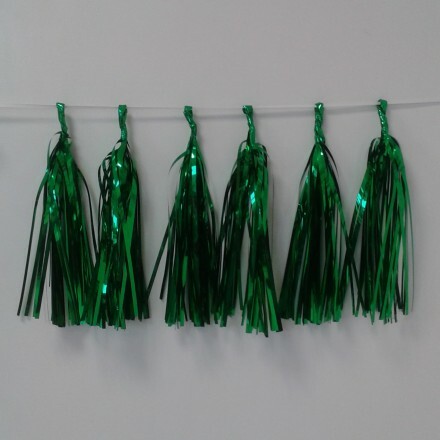 Flame-Resistant foil tassel garland 12 green pompoms, you can make a garland from 1,50m to 2,50m. We supply a white thread of 2,50m. Fringe length is about 30cm (12 Inch). Flame-Resistant foil tassel garland 12 pompoms ( 6 gold and 6 silver). You can make a garland from 1,50m until 2,50m. We supply a white thread of 2,50m. Fringe length is about 30cm ( 12 Inch ). You can combine gold and silver at your convenience. 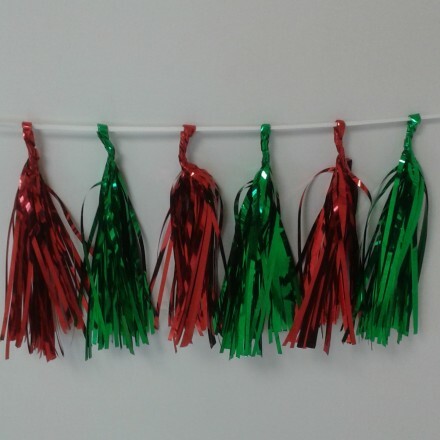 Flame-Resistant foil tassel garland 12 pompoms ( 6 green and 6 red). You can make a garland from 1,50m to 2,50m. We supply a white thread of 2,50m. Fringe length is about 30cm (12 Inch). You can combine green and red at your convenience. 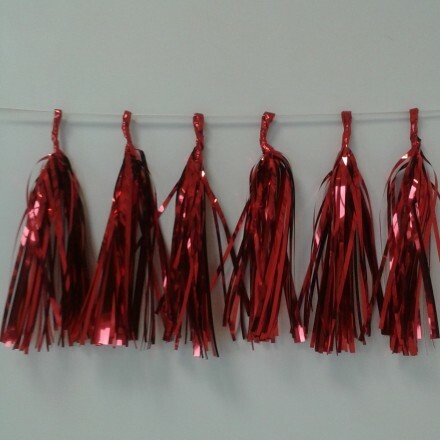 Flame-Resistant foil tassel garland 12 pompoms (6 red and 6 silver). You can make a garland from 1,50m to 2,50m. We supply a white thread of 2,50m. Fringe length is about 30cm (12 Inch). You can combine silver and red at your convenience. Our online shop offers following foil and metallic tassels colors and combinations : Silver foil tassels, gold foil tassels, red foil tassels, green foil tassels. 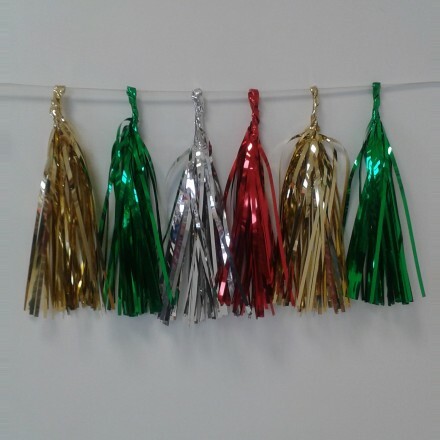 You also can buy our bicolored combinations as gold and silver metallic tassels, green and red metallic tassels, silver and red metallic tassels. 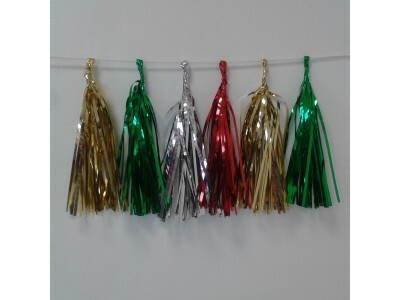 You also can find multicolour metallic tassels. 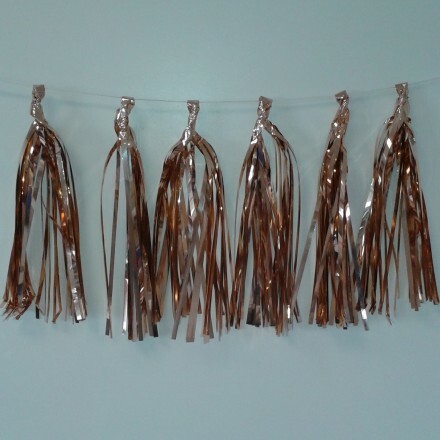 Those lovely metallic tassels are perfect to decorate your event, wedding and every occasion. You can give a magic effect if you use as a long tail from latex balloons or as a pompom to be used for garden party, Christenings, New Year’s Day. These fringes will give a unique effect for baby shower or birthday parties. Deco Party UK is the leader in metallic tassels manufacturing. Do you need any handmade foil tassels ideas? 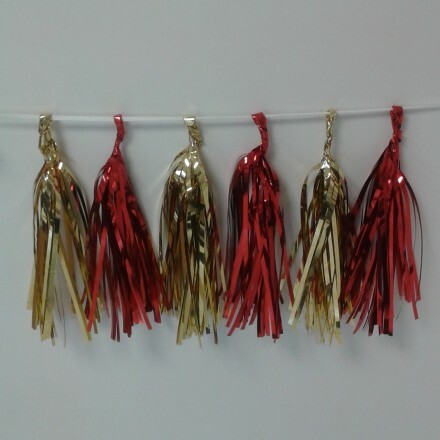 Our foil tassel gold, silver foil tassel garland or red foil pompom tassel are in fact only one item you can easily make at your convenience. 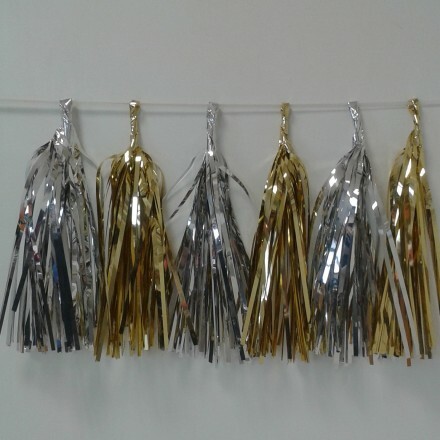 Indeed we have made and supplied foil tassel party supplies in a pack with 12 tassels ( pompoms ) and a white thread so you can make metallic tassel garland to get a wonderful home décor, you can make pompom for individual decoration or you can make your tassel tail so a lot of ideas for a lot of festive decorations. - Mix and match your colours as desired! 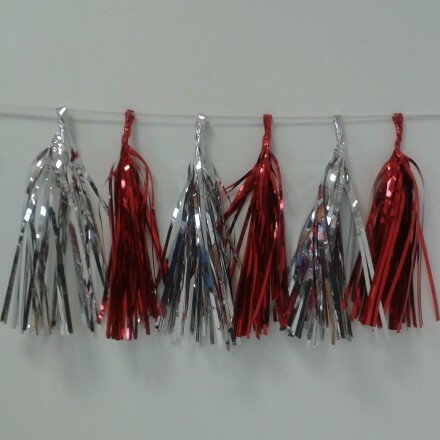 Deco Party UK is a French foil tassels and metallic pompom manufacturer. If you would like to buy in bulk and you have been a UK or an Irish wholesaler, reseller, retailer, feel free to contact us and we will offer you special prices. We can make your own packaging, with your own labels, special packs following quantity you are able to buy from us. Indeed, we supply our tassels by 12 in the pack, but we can make special packages with only 6 tassels or more as 18 tassels. Our factory is able to produce to own needs and very high quantities.